Another week in the green for the cryptocurrency market. Dare we say, “The bear market is over?” With a couple of dips along the way, the total market cap grew from $133.8B to $137.4B this week – almost three percent growth. 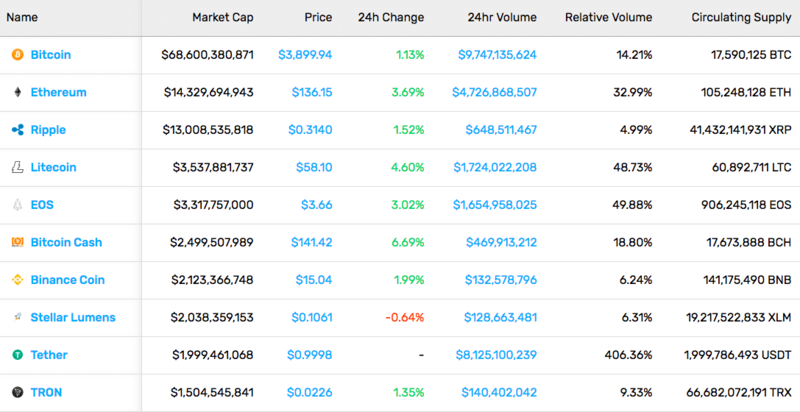 A few altcoins had impressive weeks as well. Stellar (22.09%), Cardano (17.59%), and Dash (10.12%) all saw double-digit increases. Most notable, however, was Crypto.com Chain’s (previously Monaco) got a 471.28% rise. Bitcoin saw a 0.72% increase in value. Ethereum played dead, moving just 0.04% upwards. The Taller the Pyramid, the Further the Fall: OneCoin leader Konstantin Ignatov was arrested at the Los Angelos International Airport last Friday and promptly charged with numerous accounts of fraud. Ignatov and his sister ran a cryptocurrency pyramid scheme in which they stole billions of dollars from investors. Starting the Bulgarian company in 2014, the two rewarded users through a multi-level marketing campaign for recruiting additional people to purchase “cryptocurrency packages.” However, OneCoin didn’t actually use a blockchain, falsified mining, and internally set a price for the coin without regard to supply and demand. Security? What Security? : Oh, happy day – a little regulatory clarity! Colorado officially passed the Colorado Digital Token Act late last week. The new law effectively states that digital tokens with a consumptive primary purpose are not considered securities in the state of Colorado. So, if you’re creating a utility token, you should be in the clear. Read TalkMarkets' latest news on cryptocurrencies here.